Last Tuesday, both work and recreation brought me to downtown Saint Paul’s Lowertown. My colleague Sherri and I had meetings at the Union Depot for Wilder Foundation’s Ordinary Magic event on Friday, October 7, and I returned downtown that evening to enjoy one of my favorite summertime activities – Saints baseball at CHS Field. Being in the beautiful Union Depot brought back memories of when I first worked at the venue in 2014 for the Minnesota Book Awards Gala. We knew sound could be an issue in the large and cavernous Waiting Room space that had recently been renovated and made available for events, so we focused even more attention than usual to that facet of our preparation. The extra focus of sweating the details of the audio plan for the Book Awards paid off. Our audio visual company knew the space better than any other vendor, and the quality of the sound throughout the program was flawless. This month’s newsletter focuses on audio visual (AV) – one of the most critical, yet underappreciated elements of an event. Only when something doesn’t work are guests likely to comment on your investment in AV. Earlier this month, Sherri and I had the opportunity to have lunch with two of our favorite people in the industry – Tim McVean and Emily Ankeny from AVEX. A locally-based audio visual company, AVEX has taken great care of Ann Plans and our clients for more than five years – making our nonprofit clients look and sound great. Respect the power of sound. If people have trouble hearing, they will tune out. Poor sound quality is a part of the experience guests will remember and talk about post-event, and, if your event is a fundraiser, you are guaranteed to raise less money. One of the most important lessons I learned early in my career is that a venue’s house sound system often isn’t sufficient for our event needs. Seeing is believing. Almost as important as how well guests can hear is how well they can see. As a rule of thumb, if guests will be more than 50 feet from the stage, consider investing in IMAG (image magnification) to project what is happening on the stage onto screens or monitors. Know your format. Confirm video and PowerPoint formats with your audio visual partner well in advance of your event. Most presentations today are created in a 16:9 widescreen format. To ensure your visuals project correctly, it is important to coordinate between your AV team and those creating your video and PowerPoint files. Pre-work is critical. Have at least one pre-event meeting with your audio visual partner to review show flow, floor plan, equipment needs, and placement of components such as speakers, screens and lighting elements. Shopping around is okay. As with other event expense items, getting multiple bids often makes sense. A venue’s in-house AV company may be a good fit for your event, but know that the option almost always exists to bring in an outside vendor. Rehearsals are invaluable insurance.Schedule time on event day to run through the script making sure all audio visual cues are clearly marked. Test videos and run through PowerPoints. Give all of your speakers the opportunity to do a run through on stage, and make this mandatory for anyone who doesn’t routinely do public speaking. Think of lighting as a décor element. Lighting can be a great way to maximize your décor budget. Uplighting adds color and drama to a stage backdrop, architectural features such as pillars, and full walls of otherwise blank drywall. Lighting can also bring focus to areas in your reception you want to highlight such as a live auction display. Gobos are a great décor go-to. A gobo is a stencil that light projects through, and it can help brand your event and/or add interesting textures to floor, wall or ceiling spaces. 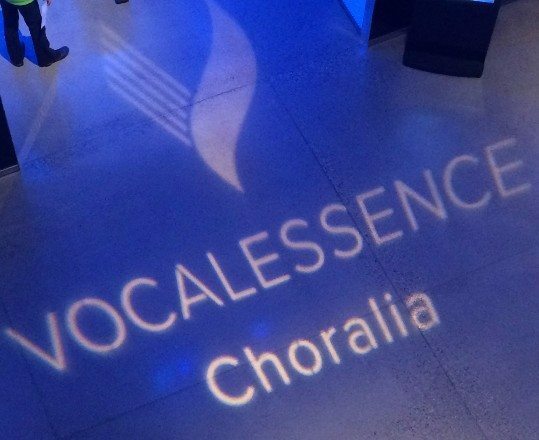 Below is the gobo we used in the lobby of the Radisson Blu Mall of America for VocalEssence’s Choralia event this spring. Gobo at the 2016 VocalEssence Choralia – Radisson Blu, Mall of America. Ann Plans is thrilled to be partnering with Minnesota Communities Caring for Children (MCCC), the home of Prevent Child Abuse Minnesota. MCCC, our newest client, has brought us on to help plan the 2016 Midwest ACE Summit taking place November 10-11. This regional conference will bring together social workers, teachers, pediatricians, mental health practitioners, community-based nonprofits, and state and local health and human service agencies. I hope this newsletter finds you enjoying the all-too fleeting sights and sounds of Minnesota summer. It’s the best AV of all.